Paradise Kiss is all about relationships. Friends. Co-workers. Family. Lovers. And Paradise Kiss goes a long way to showing that all of these relationships, minor or major, make a difference and effect your decision, consciously or not. Growing through experience plays a solid tune throughout the series. As each character goes down their paths, some having a better idea of where they are headed than others, no one is alone on their journey. Hiroyuki, the seemingly average man among men, plays pivotal roles in much of the story despite being not quite part of the group. I always took away the message of Paradise Kiss being that what we think we want, what we actually want, what we need, and what we get are all very separate things. No matter how much we may try to get them to be the same we discover life is about dealing with the fact that these four things may never meet up no matter how much we try to make them. All the member of Paradise Kiss kiss deal with these clashes of desires and realities both romantically and professionally throughout the series. But there is one character who on the surface seems out of place. Hiroyuki Tokumori seems to be a minor character who is both above this and apart from this. But on further analysis we see that he is not only a key player in all the lives of the main characters but also just as torn and effected by these conflicts as everyone else. Hiroyuki is like the normal guy in crazy town. Yukari is trying so hard to act normal that it comes off as abnormal and she doesn’t yet know herself so by contrast Hiroyuki seems very natural, he knows who he is. Even if that guy may not be as hot-blooded as the rest of the cast. Hiro is a grounded spirit both intelligent and reasonable, but not without feeling and compassion. As the series goes on he shows his greatest strength (and past weakness) is being able to see situations from other people’s point of view, to think in multiple perspectives, while also slowing revealing his own desires. His selflessness has hurt him in the past with Miwako, and hurt her as well, but he uses those experiences to support Yukari and help her sort out her mixed-up feelings. He changes enough that the same mistakes don’t plague him, but he doesn’t fully turn away from who he is. And he is even able to help Arashi reconcile his guilt about how he treated Miwako. Normally the main character is the center of all the major love triangles in the series. While Yukari is at the center of her love triangle she is completely out of the center of the other major love triangle in the series. Hiroyuki is actually the linchpin in both of the main love triangles in the story. Seemingly the eye of calm in a hurricane of drama. Yukari starts the story with a crush on Hiroyuki until she find herself hopelessly drawn to George. But Hiroyuki remains in her orbit the whole series. We also learn that Hiroyuki was in involved in a triangle with Miwako and Arashi and his role has never been properly resolved. In both triangles Hiroyuki is the more conservative choice. George and Arashi are distinctly more dangerous and have a bad boy edge to them. He seems like a dedicated student that has his future mapped out for him. George and Arashi seem supremely confident but as the series goes on we learn they are both in turmoil about their careers and the romantic relationships. Hiroyuki appears to have avoided the dilemma as he is doing exactly what he wants. But is this the case? Is his life as idyllic at it seems? Hiroyuki is an unexpected linchpin in the complicated relationships of Paradise Kiss. He is the foil, the good guy, the guy that got away, the childhood friend, and the first love and he occupies a spot in two completely different triangles of love. At the end of the day, a true triangle has two very dissimilar guys on its ends so who is better suited against the passionate George and Arashi. But in many ways the girls, Yukari and Miwako, don’t realize a triangle exists; they are so focused on their current love affairs there is little room for another. But George and Arashi are a different story, their insecurities manifest brightly because of Hiro; each reacting to the threat, one with feigned indifference and the other with jealous anger. They both believe Hiro is better for their respective love interests than they are, and even the reader as much as we fall in love with George and Arashi worries they may be right. As the stories resolve themselves, bitter sweet as it is, everyone ends up right where they belong. We learn that Hiroyuki is not that different from the rest of the cast. He too can be just as torn and just shattered by the fact that his conflicting desires, his needs, and realities of life were completely in disarray. 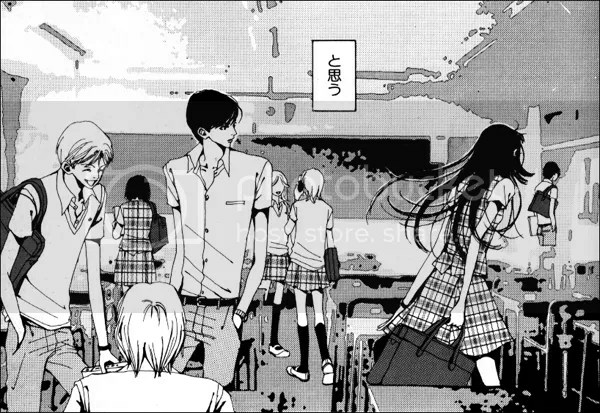 We learn that he was in love with Miwako before he moved due to school. 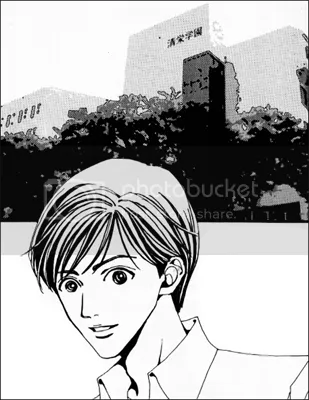 He is always expressing an interest in Yukari throughout the manga despite her being obsessed with George. We see that he has had doubts about what he is doing with his life. He never started out with utter confidence that his academic path was the right choice. But how he is different is that he reacted to these challenges differently than the rest of the cast. Unlike the rest of the cast that avoids or ignores their conflicts Hiroyuki faces them head on. He determines what he wants depending on the set of cards life has given him. The fact that he takes control makes him seem like everything is effortless and simple for him. He is like a swan seemingly calm on the surface but kicking his legs furiously like everyone else under the water. No one person’s love is like another person’s love. Paradise Kiss highlights the way a heart thinks vs. the way a mind thinks and how people make compromises between the two. Never is that a more complicated balance than in matters of love. It is an exaggerated romance, but that doesn’t mean there’s no truth in it. Central to this is a cast that has more flaws than perfections, people who get swept up in their ideas, their passions, and their emotions. Hiroyuki makes it clear that how you see others, yourself, and in turn how others view things are all very different indeed. Hiro isn’t the most shining character in Paradise Kiss but he brings a balance to the story that is indispensable. Ultimately this difference is one of the keys to how the series ends. We learn that it is amazingly easy to fall in love with George. The problem is that it is almost impossible to BE in love with him. He is too self-absorbed in not dealing with his issues to have enough room for someone else. This eventually leads Yukari to end up with Hiroyuki. He is hardly perfect but he is someone who can be a partner to Yukari. Hiroyuki ultimately mends the broken bonds between Miwako, Arashi, and himself as well. Hiroyuki is like the members of Para Kiss despite seeming like an outsider. He just learned to be himself much sooner than the rest of them and that makes all the difference. Amazing analysis. I am grateful that you did an analysis on Hiro specifically because he is such an important piece of the plot, but no one really takes note of him besides at the end. I think you’ve hit the nail on the head in saying he is the heart of the story. As the normal guy, he’s the most relatable, too, or at least he’s what we all want to be – reconciled with reality and learning how to move forward in this confusing world. Besides his caring attitude towards Yukari, I think that’s the reason why I fell in love with Hiro throughout the plot more than any other character (besides that makeup artist guy). He’s trying to figure things out, but can move forward with what he decided because he accepts and tries to work with life’s whims. Thanks so much for sharing this analysis. It’s beautifully written.